A WIDOWED FATHER-of-five from Co Kerry who was overcharged by Bank of Ireland on his mortgage payments is now in a battle to stop the bank from taking his family home. The bank secured a possession order on 40-year-old Raymond Flavin’s house in Lisselton last year, only to later admit he had been caught up in the tracker mortgage scandal. On 14 February this year he received a letter from Bank of Ireland to inform him he had been charged the wrong rate of interest on his loan for “a period of time”. Last year it emerged that thousands of Irish mortgage customers who were entitled to a tracker interest rate on their mortgage were denied the right to one or denied the option of one. Thousands of other customers – of which Flavin was one – were charged a higher rate of interest than the rate specified on their loan documentation. In a countrywide review, more than 15 lenders – including Bank of Ireland – were found to have charged up to 15,000 customers more expensive rates. Despite its recent admission of error, the bank is still fighting Flavin’s appeal against the possession order granted in the Circuit Court last year. 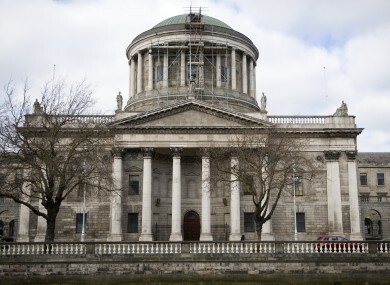 In the 14 February letter to Flavin, seen by TheJournal.ie, Bank of Ireland said that as part of its tracker mortgage examination, it had determined he had been impacted because he was “charged an incorrect margin on your tracker rate of interest”. “This means you have been charged an incorrect rate of interest on your mortgage for a period of time and this letter sets out actions we are now taking to put this right,” the letter continued. We sincerely apologise for this failure and for not moving you to the correct lower tracker rate sooner. The letter goes on to say it will move Flavin’s account to the tracker rate set out in his mortgage documentation “in order to ensure that you do not experience any further detriment as a result of our failure”. It also explains that it will complete a detailed review of his mortgage account to determine any redress or compensation that may be due to him. The father-of-five, who is the first person at risk of losing their home and affected by the scandal to speak about it publicly, said he was “shocked” when he read the letter. Flavin works for his father’s coach company and in 2013, as he was working underneath one of the buses, it fell on top of him causing serious injury to his back. He was in a wheelchair for six months and was out of work for close to a year in total. “I couldn’t keep up the mortgage payments. I just had social welfare and all that went to keep the family,” he told TheJournal.ie. He approached the bank to discuss his financial difficulty and his monthly payment rate was eventually reduced, but as he continued to struggle with his repayments, his arrears built up and in 2014 the bank started court proceedings against him. At this time, he was in arrears of €18,000. Because Bank of Ireland has not told Raymond Flavin for how long he was overcharged, it is not yet clear how much he may have potentially overpaid on his mortgage. The bus driver has been representing himself throughout the court proceedings as he said he cannot afford to hire legal representation. Civil legal aid is unavailable to citizens involved in property disputes. “If I had that kind of money to be spending, I’d be repaying my mortgage,” he explained. In July last year the bank was granted a possession order on his house and he is now in the process of appealing that decision. Raymond’s wife Trish died in early January of a heart attack. She was 38 years old. The couple have five children – boy and girl twins aged 5, a boy aged 6, a girl aged 11 and the eldest, a 16-year-old girl. He said the house is now “all my children have left”. The Central Bank revealed late last year that about 100 homeowners subjected to wrong interest rates have had their properties repossessed. Solicitor Gary Matthews, who represents a number of clients affected by the scandal said he is finding, on average, that people have been overcharged in the region of €20,000. He said the banks have been writing to people offering to reimburse them and give them compensation of around 10 or 15%, but he is urging anyone affected to also pursue the bank for consequential losses. He believes the banks must do more to compensate those individuals impacted. “Banks are writing to people individually and saying due to administrative errors, or whatever, that their account has been wrong and they are refunding their account and giving them small compensation,” he explained. “Banks are not compensating people for the losses they have incurred during the time they were being overcharged. “What I mean by that is the loss of opportunity to use their money. The loss of opportunity to go away on a holiday, or the loss of opportunity to spend money on their children or the loss of opportunity to spend money on that business they were always thinking about,” he said. People don’t understand the consequences the overcharging scandal has had on their personal lives. The pressure that this brought to bear on relationships. What we have found is that a large percentage of the cases their personal relationships with friends and families were affected. Some relationships did not survive, people had to go to family members and ask to borrow money to keep up these payments and that was a huge source of personal embarrassment. Matthews said the damage caused by this scandal is, in some cases, irreparable as people had already lost their family home when they were informed of the bank’s errors. “There are strangers living in these people’s family homes now and what figure of compensation should you get for something like that? We are finding in approximately 50% of the tracker cases that on the date that the bank wrote to the people and said they were in arrears, that people weren’t even in arrears when you looked at how much they were being overcharged. There is one case I have where a bank said this person was €18,000 in arrears – he was actually €55,000 in credit on the right figures. They got an order of possession on his home and he then came to me and they were just in the process of enforcing it and giving it to the sheriff and getting him evicted when he came to us. Not only did they set aside the order, they’ve reimbursed him his €55,000 and we’re pursuing them for consequential losses. He was on the verge of being put out of his family home. Matthews, who is now offering his services to the Flavin family, urged anyone who received a letter from their bank telling them they were overcharged, to seek legal advice. Flavin has also been supported by The Hub Ireland, which offers to lend a hand to people with mortgage difficulties. The Hub’s founder Byron Jenkins said there is an “epidemic” of mortgage difficulties in this country. His is just one of a number of cases involving the tracker mortgage scandal that the Hub’s team of volunteers has come across. “We had one chap where they’ve repossessed his family home and sent him a compensation cheque of €50,000, with a cover note saying that if he feels the need to sue, cashing the cheque would not negate his right to sue – so he is. Another two guys about a year ago had cheques in their hands of €9,000 in compensation. Jenkins pointed out that most people have had no dealings in the courts before and have little understanding of how it works. By the end of last year, Bank of Ireland had identified at least 600 accounts where a right to, or the option of, a tracker rate of interest was not provided to the customer in accordance with their loan documentation. While conducting its review the bank also identified a rate differential, of on average 0.15%, on 3,916 accounts currently on a tracker rate of interest which is not the rate specified in the account loan documentation. When approached by TheJournal.ie, the bank declined to comment on Flavin’s case and referred us to their latest statement on the tracker mortgage scandal, which was released in December. In an update last month, the Central Bank said that lenders had identified 9,900 loans impacted by the errors. About €78 million in compensation has been paid out to 2,600 of those accounts. Financial institutions say they will identify all homeowners impacted by September. Email “Tracker mortgage scandal: Widower charged wrong interest rate may now lose family home”. Feedback on “Tracker mortgage scandal: Widower charged wrong interest rate may now lose family home”.